Kojo Senoo/Pipe Dream Photographer Keynote speaker Suezette Robotham, a diversity, equity and inclusion program manager at Google, speaks about the obstacles she overcame as a woman of color in the technology industry. Kojo Senoo/Pipe Dream Photographer The Black Student Union and Multicultural Resource Center kick off Black History Month with keynote speaker Suezette Robotham. 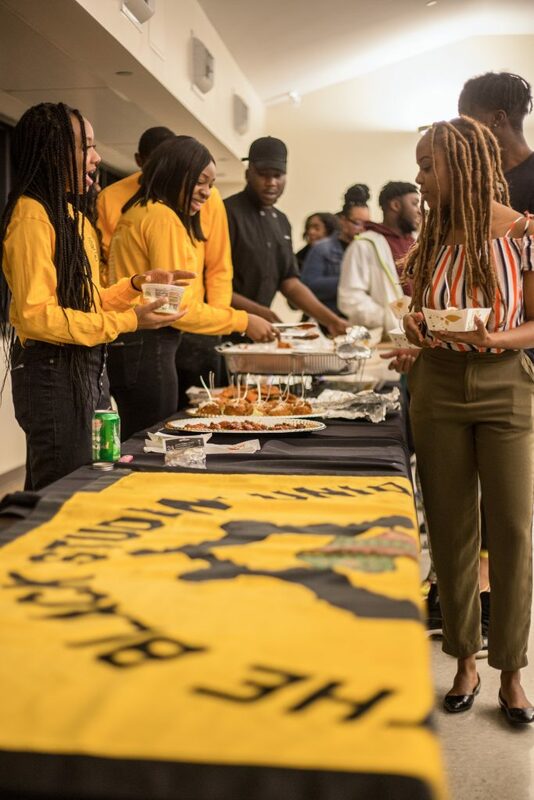 Roses set in concrete stones lined tables in Old Union Hall on Monday, paying homage to Tupac Shakur’s poem “The Rose That Grew from Concrete,” as the Black Student Union (BSU) and the Multicultural Resource Center (MRC) held their 50th annual Black History Month kickoff event. The event, titled “Resilience: Achieving Black Excellence in All Aspects,” aimed to empower students to overcome their struggles and embrace diversity by celebrating achievements by black people in different industries. 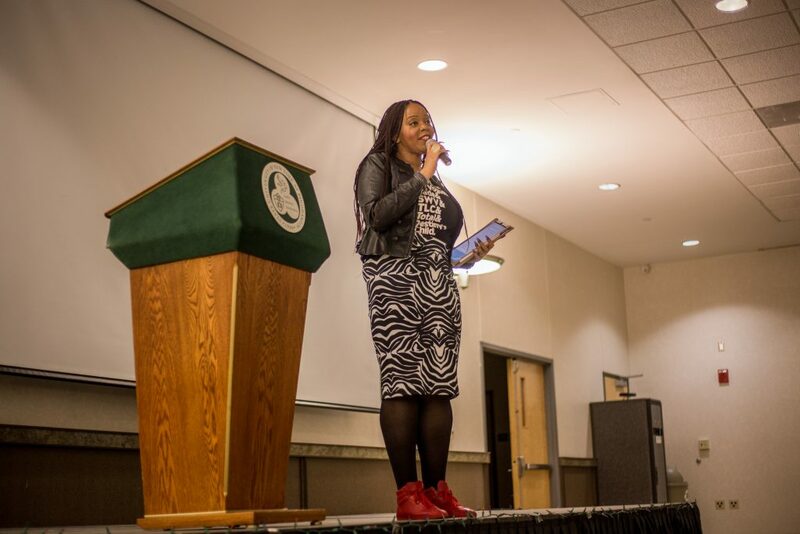 It featured keynote speaker Suezette Robotham, diversity, equity and inclusion program manager at Google. Tanyah Barnes, associate director of the MRC, said the center invited Robotham to speak at the kickoff event because her experience in technology makes her relatable for students. Robotham discussed the challenges of entering the technology industry as a black woman and said she believes everyone ends up where they belong despite the obstacles that arise. She also encouraged students to take pride in their heritage and said although black voices often aren’t valued, they should be. The event also featured a backdrop of newspaper articles from the past 50 years, showcasing African Americans winning awards and accomplishing goals in the workforce. Jonah Liautaud, vice president of the BSU and a senior majoring in sociology, said the backdrop showcases the struggles African Americans had to overcome. “It was never easy, but the people in these headlines helped pave a path that we need to keep carving,” Liautaud said. Robotham said African Americans have historically used their voices to speak out against injustices and should continue to speak out to create change in society. Andy Jean-Baptiste, Student Association vice president for multicultural affairs and a senior double-majoring in economics and philosophy, politics and law, said he recognized the courage it took for Robotham to speak about the experience. Like the roses in cement, Janiera Headley, president of BSU and a junior majoring in economics, said that the event successfully showcased how far African Americans have come through resilience.